Riding on the apathy of the masses, crony Communists rig the elections in a small, corrupt post-Soviet backwater to retain their iron grip on power. But their dastardly plans to crush democracy and draw benighted Moldova back into the Eurasian darkness are foiled by the heroic students of Chisinau. Inspired by their boudiccan (and photogenic) figurehead Natalia Morari, heroine of past struggles against corrupt authoritarianism, they flutter out into the city center and Tweet their nation back into the light of Western iCivilization, toppling the old guard under a colorful cascade of fruits and flowers. This is the kitschy Western narrative of color revolutions, in which electronic networking technologies marry the springtime national aspirations of peoples suppressed by corrupt satraps from Muscovy to produce a verdant and fertile liberal democracy – Atlantean outpost and bulwark against Eastern tyranny. Yet one would have to wear rose-tinted spectacles (or read fantastic literature to excess) to subscribe to this interpretation. The Rose Revolution in Georgia withered away and died under the chill of Saakashvili’s quasi-authoritarian rule and the heat of aggressive war against Russia in summer 2008. Meanwhile, the Orange Revolution putrefied into mush, succumbing to the sickly moist of endemic chaos, corruption and economic decline that characterized Ukraine after 2005. A dispassionate analysis of the “Grape Revolution” in Moldova reveals that its fruit was rotten from the beginning. Although it is true that many of the protesters were genuinely disaffected university students and migrants, it is also clear that certain elements were Romanian nationalists, liberast provocateurs and common hooligans. The three parties which won 35% of the vote have a “distinct nationalistic flavor”, according to Natalia Sineaeva-Pankowska writing in Moldova: Torn between the Communists and the far right1. The nationalists criticize the Communist plans to revise ethnic Romanian-centered history textbooks to better reflect Moldova’s multi-ethnic identity and extend the Holocaust interpretations taught in schools to include the role of Romanian collaboration, from its current limitation to the “German extermination of Jews and Roma”. They favor closer ties to and reunification with Romania. The intensely pro-Romanian Ghimpu is known as an admirer of fascist dictator Ion Antonescu and notorious for his remark on a Turkic, Orthodox ethnic minority within Moldova – “Gagauzians are the ulcers on a body of the Moldovan people”. They are supported by the newspapers Timpul and Journal de Chisinau, which are known to have given platforms to Greater Romania nationalists and Holocaust deniers. The other main opposition leader, Filat, has a not unimpressive reputation as the biggest thief in Moldova. He was involved in major scandals surrounding privatization of wine factories, aircraft sales and cigarette smuggling from Moldova to Romania2. There is also a theory pieced together in Moon of Alabama that the protests were just the simulacrum of an oligarchic power struggle between President Voronin and the Romanian-supported tycoon Anatol Stati3. His Moldova-based company, ASCOM Group, reaped a 2bn $ fortune drilling for oil in Kazakhstan but now stands accused of concealing income from Romania- and Turkmenistan-related businesses and violating UN sanctions against Sudan. Incidentally, most of ASCOM’s business is run through Tristan Oil, which resides in the British Virgin Islands tax haven. However, the aforementioned Timpul newspaper claims that the Voronin clan is simply trying to usurp Stati’s business4. The second man in Tristan Oil is Artur Lungu, who has extensive connections with Anglo-American democracy and transparency promotion organizations such as USAID, the Soros Foundation and the John Smith Memorial Trust. Anatol Stati’s son, Gabriel, has important ties with young and Romanian nationalist organizations and called the people to vote against the Communists in the elections; he was recently arrested in Ukraine on a Moldovan extradition request5. This is the fundamental dilemma – we are facing a struggle between populist Communists and populist nationalists, many of whom are illiberal and corrupt. But what about the likes of Morari, who claimed she only expected 300 people to turn up and disavowed violence – are these original Twittering protesters pure? It is hard to contain cynicism. As Daniel McAdams points out in Moldova’s Twitter Revolution: Made in America?6, Moldova is the poorest country in Europe – furthermore, only 16% of the population has Internet access7. Where did the Twitter-compatible iPhones and technical training come from? They are the legacy of US-funded NGO’s operating in the post-Soviet space. One of the leading youth movements committed to overthrowing the Communists is the Hyde Park organization, whose website is hosted by the Internet Access Training Program – funded by the US State Department through the Freedom Support Act. Furthermore, USAID – for whom the aforementioned Lungu worked – openly funnels generous amounts of money through “cut-out organizations like the International Republican Institute and the National Democratic Institute” for programs such as Strengthening Democratic Political Activism in Moldova – “cultivating new political activists who can formulate and pursue concrete political objectives…”. Evgeny Morozov, creator of the “Twitter Revolution” theme9, in later essays acknowledged that although it played a very minor part in the planning of the protests it was crucial to creating and sustaining Western interest in events in Moldova10 – because so many Westerners themselves used Twitter, it needed very few Moldovans at ground zero to get the #pman11 flood started. Once that happened it took on a life of its own and ignited a continuous stream of user-generated content on LiveJournals, blogs and popular social-networking sites that soon seeped into the Western mainstream media. Are the “Liberals” Really Liberals – or are they Liberasts12? Although a fascinating discussion, the above misses the forest for the trees – the real question is whether or not the original “liberal” protesters intended their little protest to conflagrate into a mass bunt culminating in the storming of Parliament. It is important to keep in mind that Morozov is a former “trainer” for various “civil society” outfits in the use of new electronic technologies to mobilize and actively supports the policy of color revolutions. On meeting the activist Oleg Brega, he approvingly remarked on his “almost uncanny ability to rely on the Internet (as well as mobile and video technologies) to bring public attention to his causes”13. The example he gave? “A typical Brega stunt: provoking the Moldovan police to arrest him and have someone capture this on video and then republish to YouTube”, followed by a hyperlink to those “video provocations”. Furthermore, Oleg Brega is a proud member of the aforementioned Hyde Park organization, which is headed by Gheorghe Brega, a Romanian citizen14 and member of Ghimpu’s Liberal Party. The front page of its website features a diatribe against “Bolshevik tyranny” by the historian Iacob Golovca15, who is “President of the Civic Association for the Abolition of the Consequences of Molotov-Ribbentrop Pact”. Dr. Golovca is a Romanian ultra-nationalist16 – he refers to Moldova by its old regional name of Bessarabia and calls for its return into “Romania’s bosom”, without the “gangrenous germ” of Transnistria which is to be “amputated”. Antonescu is a “martyr and hero of all Romanians!”, Russians are the tyrannous, perennial enemies of the Romanian people and he hates Ukraine too. Oleg Brega, Natalia Morari and several others, all seemingly part of a core group, were the original organizers. They argue that they did not expect more than a few hundred people to show up; some commentators, like Nancy Scola17, believe that the protests metastasized because those who got #pman spread the message ever wider into the social net. She makes the comparison with how an initially low-key house party, without effective face control, can erupt into an epic rager ending with the police busting the place. They too are now threatened with arrest. From the above, it appears that Mr. Brega is like an onion – a liberal skin, a liberast interior and a Romanian nationalist core. He was trained for revolution and very likely the other members of the “core group” were too. Furthermore, once you get a critical mass of people into the streets using social media like Twitter to connect key players (or nodes, in network jargon), your work is done and the rest falls into place. It is then time to shift gears and start denying culpability – which is what Morari and Co. are now concentrating on. This is not to say that they are necessarily guilty of “calls for organizing and staging mass disturbances”, as the Moldovan authorities allege – but we should not give them a free get out of jail card either. 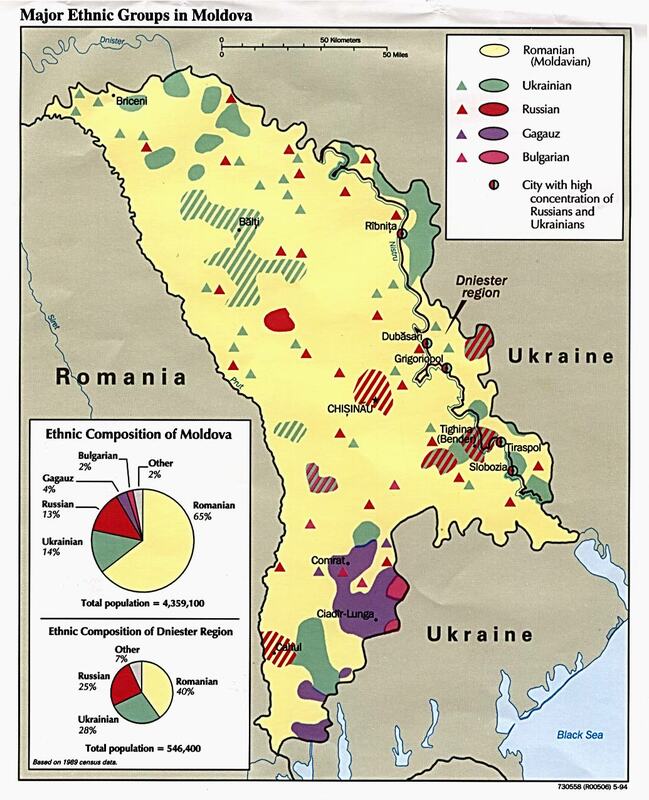 Moldova’s geopolitical priorities are to consolidate its multi-ethnic society and resist encroachment from Romania and Russia. The first means it has to satisfy internal ethnic minorities like the Gagauz in the south, a Turkic Orthodox people enjoying an autonomous status within the country, and draw Russo-Ukrainian Transnistria back into the fold. Although Transnistria has just 0.6mn people to 3.4mn in the rest of Moldova, it is also its richest and most industrialized region. There are growing social forces in Moldova seeking reunification with Romania for nationalist reasons and as an easy path to EU membership. Already between 10% and 20% of Moldovans have Romanian, and by extension EU, passports. The fear of Romanian expansionism frightens Transnistria away from reconciliation, while the “Kosovo precedent” gives its arguments for independence more weight18. On objective criteria Transnistria has a much better case for independence than Kosovo and indeed any of the other small, post-Soviet quasi-states, according to Michael Averko19. Historically it was never under Moldovan control, suffered 2000 casualties from a Moldovan attempt to reassert control in the early 1990’s and its people overwhelmingly voted for independence in free referanda20. Further undercutting its portrayal as a kleptocratic Stalinist holdover, the British Helsinki Human Rights Group believes it to be better off than Moldova proper. The rule of President Voronin was characterized by geopolitical dithering between West and East. Although seen as pro-Moscow upon first being elected, he opposed Moscow’s settlement plans for the breakaway region of Transnistria in 200321 and shifted West, declining to attend the 60th anniversary to the victory over Nazism in Moscow in 2005, dropping support for the Common Economic Space (a proposed free trade zone in some countries of the former USSR) and focusing more on Euro-Atlantic integration. Recently analysts perceived a tilt back to Moscow – either as part of a grand strategy to get attention from the West to its Transnistrian problem or over genuine fears about Romanian encroachment and what it would mean for the eventual resolution of the Transnistria Question. How Much was the West Involved? The major motive for a Western push to topple Voronin is to reverse their recent geopolitical setbacks across the Eurasian periphery and send a message to Moscow. Although the Obama administration ostensibly aims to “reset” relations with Russia, this does not mean it has dropped its longterm geopolitical objective of pre-empting the rise of a Eurasian hegemon. We must not forget that Obama’s foreign police advisors include Zbigniew Brzezinski (a latter-day proponent of the “Promethean project” to break up the Russian Empire, whose intellectual ancestor is the Polish interwar dictator Piłsudski) and many Clintonian liberal interventionists. That said, unlike in the Baltic “popular fronts” or the Orange Revolution, direct US involvement in Moldova was probably non-existent. Firstly, as mentioned above Voronin is not unqualifiedly pro-Moscow. He is a rational opportunist, tilting to whichever side will best serve the national (and perhaps more importantly, the personal) interest. From his perspective, Russia can provide a short-term degree of political and financial cover that the West is unwilling or powerless to. Trying to overthrow, or appearing to try to overthrow, guys like him can produce dangerous blowback. Uzbekistan cardinally changed its geopolitical orientation from the US to Russia after the bloodbath in Andijan. Further afield, Chávez only became firmly anti-American after the failure of the CIA-backed coup against him in 2002. Secondly, Ukraine and Georgia were humiliating failures and probably made the Americans think twice before giving one-sided support to revolutionary movements, especially those incorporating unsavory nationalist elements. Hopefully US foreign policy is no longer hijacked by the neo-con / Soros liberal agenda to push their vision of democracy on countries and peoples that don’t care for it. Finally, if a color revolution really had been in the works then OSCE wouldn’t have declared the elections “free and fair”, thus invalidating a vital moral prerequisite for a revolution. Therefore the Baroness (Emma) Nicholson’s complaints that it was “difficult to endorse the very warm press statement” should be taken with a pinch of salt – particularly since immediately after, she says, “The problem was that it was an OSCE report, and in the OSCE are, of course, the Russians, and their view was quite different, quite substantially different, for example from my own”. OK.
Perhaps she was upset that they had missed an opportunity to undermine a fickle ally in favor of the young, pro-Western and colorful protesters? Or maybe she was genuinely distraught over how they did not properly voice their “very, very strong feeling” that the election was flawed (which indeed it probably was – exit polls suggested the Communists should have gotten 45% instead of 50%, three members of the Electoral Commission resigned and the Communists agreed to a recount)? It’s hard to say given the degree of opacity in all this, but one thing we can all agree on is the irony of a Baroness expounding on democratic procedures. Are the Communists really so unpopular and anti-democratic? Some commentators sought to portray the Moldovan Communists as dinosaurs who hate change and democracy, and are only supported by an aging sheeple brainwashed by vodka and “sovok” propaganda. This is an admittedly an exaggerated characterization – but I think it captures what many commentators feel. Unsurprisingly, it is very inaccurate. Firstly, all the major organizations that purport to “measure” democracy disagree with this assessment. The Polity IV project, which comprehensively tracks global democracy trends since the Second World War, gave Moldova a score of 8 on a scale of -10 to 10 in 2007, qualifying it as a proper electoral democracy – for comparison, ethnocratic Estonia got a 6. The Economist Democracy Index believes it to be a “flawed democracy”, much like neighboring Romania, and even the notoriously compromised Freedom House believes it is something better than “Not Free”. According to human rights activist Andrei Kalikh, Moldova “is at once the most democratic CIS country and the only one where the Communists hold power”23. Secondly, the Communists “made significant inroads into young age cohorts for the first time in these elections”, according to Vladimir Socor24 – as the “sociologist Arcadie Barbarosie (head of the Soros Foundation’s local affiliate) observes, the Communist Party can no longer be stereotyped as a “pensioners’” or Soviet-nostalgics’ party”. Thirdly, the Communists are becoming more competent and sophisticated at campaigning. The incumbent government, “predominantly of technical experts”, makes a strong contrast to the “opposition-dominated Chisinau Municipal Council, a scene of chaos and nepotism”. Fourthly, it steers a shrewd line between long-term European aspirations, on which there is a national consensus, and preserving Russian goodwill. The latter is good for both the national interest (financial reasons and resolution of the Transnistria Question) and political expediency (it draws Russophone votes and interestingly, Putin and Medvedev have the highest approval ratings of any politician in Moldova). Fifthly, there remain concerns over the authorities’ reaction to seemingly manipulated election results and the heavy-handed crackdown on protesters. Regarding the former, use of “administrative resources” from all sides is an unfortunate but accepted political practice throughout the post-Soviet space and the Communists would have won decisively whether their real popular mandate was 45% or 50%. And it would seem obvious that any democratic state would react very harshly to a violent insurrection against the constitutional order. Finally, there is a certain tone of arrogance and condescension in the language some commentators use to condemn Communist supporters, repeatedly emphasizing how they tend to be rural, older and less-educated25. Forget the implied elitism and ageism and ask yourself – why are so many Moldovans really voting for the Communists? …so who voted for the Communists? A bunch of grandmas and old ladies…and? Riiiiight, lots of our parents… if the people who are now shouting out in the main square could have convinced their parents not to vote for the Communists, then maybe they wouldn’t have won? 1) Who should they have voted for? I told her, that this was at the expense of the youth, and let’s imagine that she told me she didn’t care, her own children are overseas and she’s in Moldova, she has to think about herself. This is a very good illustration of the generational divide between older, state-dependent people and their migrant sons and daughters – and the misunderstandings and acrimony arising from it. The Communists have the situation firmly in control – there will almost certainly be no revolution, grape, Twitter or durian. A simple recount will achieve nothing because the main issue relates to how many “dead souls” voted. 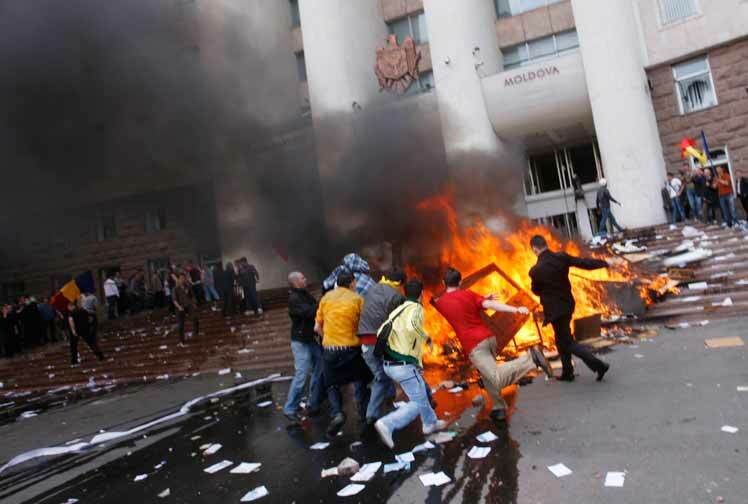 Furthermore, even if the government answers calls for new elections, any popular sympathy the protesters may have gained from Communist abuse of “administrative resources” will have been incinerated in the fires that engulfed Chisinau on April 7. The Communists will harden towards the Romanian nationalists and will distance themselves from the Atlanticists. Although Washington did not play a direct role, the Communists cannot be comfortable with the legacy of motivated, technologically savvy youth movements / liberast fifth columnists (cross out as you will) the Western NGO’s left behind. President Saakashvili in Georgia is facing a dangerous challenge from the opposition which may soon culminate in counter-revolution28; the Orange legacy in Ukraine is already largely discredited and can only continue on its path to oblivion as the social effects of Ukraine’s economic Depression make themselves felt. It is probably no longer far-fetched to talk of a “Great Split” in Ukraine between its antagonistic western and eastern parts. In this context of rapidly expanding Russian influence over the former Soviet Union, it is a safe prediction that Moldova will move closer to Russia. It would offer increased political security from revolution – be it private, Romanian or US instigated. There may also be hope for Russian financial assistance amidst the economic turbulence – remittances from Moldovans abroad, which formerly made up 25%-40% of Moldovan GDP, are now falling rapidly as they lose jobs in Russia and Europe. Finally, it offers a path to a compromise on the Transnistria Question – most likely, in the form of a neutral confederation which would shield Moldova from Romanian nationalism and allow it to profit from bridging the economic gap between Europe and Eurasia. Already on April 11, Voronin met the Transnistrian leader Igor Smirnov for the first time since 200129. In a normal society, most people are going to be more or less moderate. Since we are forced to interact with people holding a wide spectrum of views on a daily basis, our own beliefs are subjected to a constant Bayesian barrage. This leads to mental adjustment and calibration to the norm. The Internet, cell phones, interactive social media, etc – call it the ubiweb – allows one to filter the circle of “friends” they communicate with, to just those who share their positions. Since people are fundamentally conformist (of course they are – even ignoring Milgram et al., society would otherwise be populated by extremists), their attitudes will harden to conform more closely with those held within that circle. Contrary to the dreams of cyber-utopians that the information highway will lead humanity into a new age of transparency, freedom and enlightenment, many will simply imprison themselves within “enclaves of extremism”30. The mainstream media should stop glamorizing the photogenic fakery of the iGeneration in Moldova with odes to their supposedly selfless drive to spread democracy over the ubiweb. Instead, we must focus on resolving the far more human misunderstandings leading to heavy-handed authoritarianism and revolutionary extremism. In Moldova’s case I suspect it is the lack of inter-generational respect between “sovoks” and “orphans”, which manifests itself in tensions over the Moldovan and the Romanian identity, between Eurasia and the Atlantic and between likeness and similarity. We should try to foster dialog between the disaffected students and migrants, and pensioners and state workers. Meanwhile, nationalist liberasts, neo-Soviet authoritarians and cynical mercenaries fomenting revolution in the service of geopolitical agendas should be universally rejected – and instead encouraged to build enclaves of empathy with the people instead of brooding in enclaves of extremism. In Stephen King’s techno-horror novel Cell, a rogue virus transmitted across the global cell phone network turns most of humanity into “flocks” of homicidal zombies. Whenever we abandon all skepticism and refuse to question everything, we become them – a soulless flock Tweeting terror and destruction. 11Code to gather at Piata Marii Adunari Nationale, the square in the capital Chisinau. 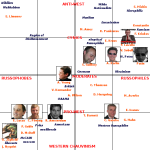 12From Wikipedia: “Liberast (Russian: Либераст, portmanteau of liberal and pederast) is a neologism in the Russian language. Ideological cliché, exclusively used by authors with malicious attitude to neoliberal reforms in Russia or to the methods these reforms were implemented. The word bears an overt pejorative connotation.” I use it to refer to people masquerading as “liberals” while using illiberal or dishonest means or pursuing illiberal ends. 25I suspect many of them are those who took offense at Obama’s comment on how small-town Americans cling to guns and religion. This was also kindly published on Johnson’s Russia List and republished at Guardian-PSJ.